We’re hosting our first ever Zoo Fan Meetup on Sun., August 22 during Seattle Geek Week and we’d love to meet our blog readers in person! Come on out and meet zoo staff and other zoo fans, and spend your day getting some sweet discounts, giveaways and exclusive activities as our thanks to you for being our biggest fans. 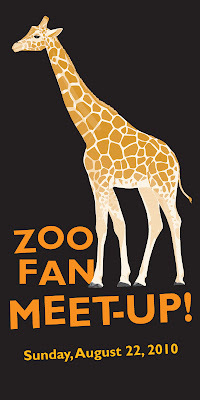 Meetup is free with zoo admission or membership. o First 20 people to stop by our booth and say the magic phrase get a special surprise gift. Stay tuned to our Facebook updates for the magic phrase! o Get free stuff! Pick up your meerkat poster, zoo stickers, temporary tattoos, magnets and more. o Enter a raffle to win a $50 zoo gift card, VIP ZooTunes tickets, or a ZooParent adoption! o Get up close with an exclusive Animal Encounter at 11:30 a.m.
- Share your updates with other zoo fans. Use the #wpzmeetup hashtag when you tweet, or post your photos and updates to our Facebook page.